Yes folks, we’re still alive! And DR.LEPUS is slowly starting to become the game we want you to play and enjoy. Since our LDJAM#35 participation we’ve been working hard to optimize our “Litiengine” with the goal to release DR.LEPUS in 2017. Technically everything is ready now and during the last month we worked hard on our self made Game Editor utiLITI which allows us to enhance maps created with the Tiled Mapeditor by the capabilities of our engine. We’ve come to a point were we are creating content without the need of first implementing the entire logic behind it and this is where a lot of visual things come into play. While working on this, we made the decision to drop the Subtitle and leave it to the LDJAM Version. Also, we decided to remake the font and clean up slightly awkward blood effect. 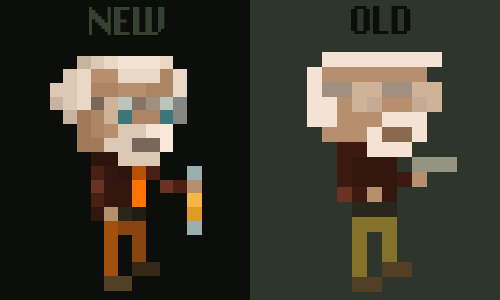 Adding some shading as well as a bit more shape to his head we think that now we squeezed the most out of the available pixels. Of course that’s not all. We’ll be updating you on a regular basis on the current progress. If you don’t want to miss anything about our work, we highly recommend you to follow us on twitter @gurkenlabs.